Free admission and parking. Ride cost varies. Queens’ picturesque Astoria Park will come alive with the sights, sounds and aromas of a world-class midway when the Astoria Park Carnival comes to town June 7-11. 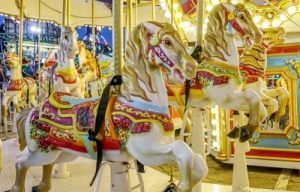 This family-friendly event features favorite fair food, games and rides for all ages, from whimsical kiddie rides to state-of-the-art thrill rides. Admission and parking are free. Ride tickets are available onsite for $1.50 each, $25 for 20 tickets, or $50 for 50 tickets plus 1 free ride. Rides take 3 or more tickets each. Visit the website for coupons for $5 off a 50-ticket Super Saver Family Pack and $2 off a $10 food purchase. Carnival hours are 5 to 11 pm Wednesday – Friday and noon to 11 pm Saturday – Sunday under the RFK Bridge at Astoria Park.